WAFFLES: Hey Boss! Glogirly's stud finder really works. Look! She's pointing it at me and it's beeping like crazy! 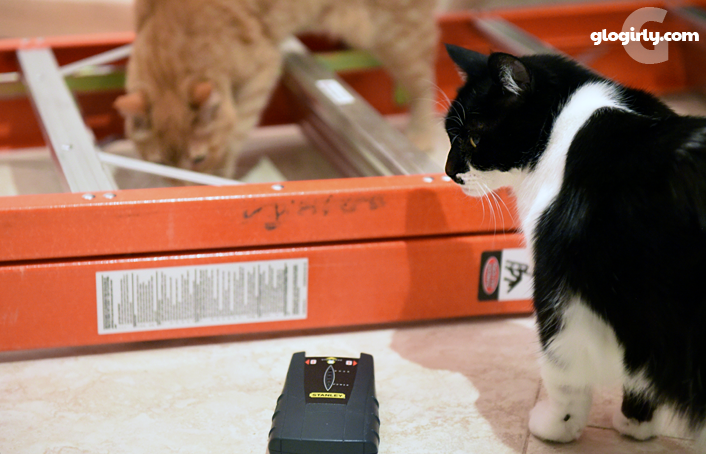 KATIE: Clearly this thing is defective if it thinks you're a stud, Waffles. It's supposed to find studs in the wall. WAFFLES: You mean we there are other handsome mancats in our wall??? WAFFLES: I don't have to share my breakfast with them, do I? Gloman is back in the mountains with us to celebrate his and Glogirly's 15th wedding anniversary later this week. (YAY!) He drove this time and arrived at about 2:00am on Saturday. And he arrived with a very special gift. Our new home has some pretty incredible walls for showcasing his photography. The main entry has been patiently waiting for the perfect photo and that's exactly what Gloman had hidden in the back of his SUV. They spent most of yesterday afternoon finding studs in the wall to support the weight of it, measuring, centering, leveling and then doing it all again when Glogirly realized her measuring and math was WAY off. But it's up now and looking fabulous! Even Waffles approves. Glogirly is absolutely in love with it and he's pretty proud of it too. 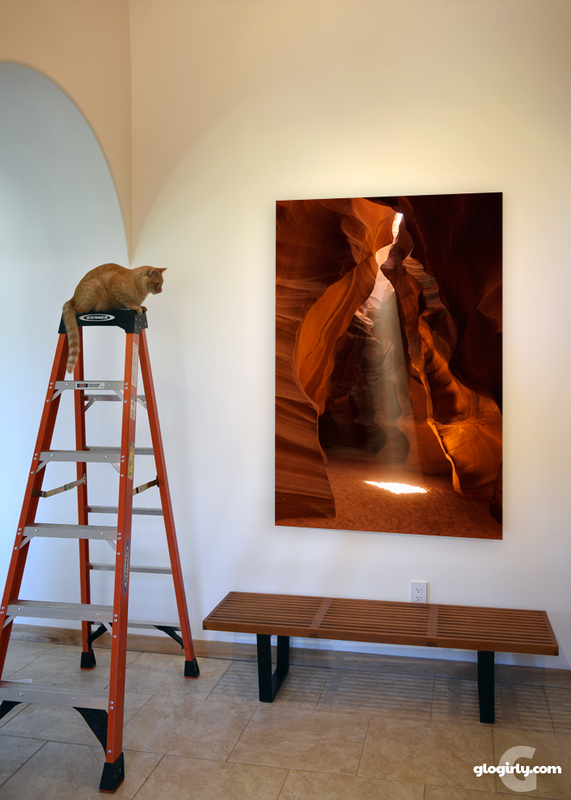 He shot it in Antelope Canyon on a trip they took together six years ago. Antelope Canyon is in Page, Arizona and is famous for its beautiful "slot" canyons located on private Navajo land. The photo is particularly special because Glogirly was right by Gloman's side when he captured it, holding his tripod and extra camera. They had a guide bring them (and about 30+ other people) into the small canyon at exactly noon, when the light shines perfectly overhead through the "slots". That is what's creating the gorgeous beam of light. The inside of the canyon is surprisingly small. In fact, some of the passageways are so narrow that only one person can fit through it at a time. What you can't see in the photo are those 30+ other people standing shoulder to shoulder while the guide is making sure none of them are in Gloman's shot. When she closes her eyes, Glogirly can still feel the cold sandstone walls on her fingertips and the warmth of the sunbeams on her back. It's every bit as magical as it appears in the photo. This is just one of the reasons Gloman loves photography so much. His images are like living memories of special places and experiences with the people he loves. WOW! That is an amazing shot. What makes it even BETTER is the personal story behind it. And, um, Waffles, studs, like the kind that contraption hunts out, are wood. So apparently it thinks you are made of wood! Gorgeous! That is a museum quality shot! Beautiful photograph. Waffles is a good little helper. Spectacular image! How wonderful to have this amazing reminder of the adventure gracing your home. Wow....amazing photo! It is so true...a good picture can take you right back to a place and time. A beautiful photo and well worth the effort to capture it! I would love to be able to see that in person. I bet that canyon is gorgeous! Maybe I should plan another trip to Arizona. I missed seeing so many sites. The emotion behind the photo makes it that much more special! Of course Waffles is a stud; such a handsome mancat! WOW! We have goosebumps looking at and hearing such a wonderful story behind the this beautiful picture! wonderful picture, and happy anniversary!!!!! A gorgeous shot, and wonderful gift. That is totally beautiful! Great story behind it as well. M is laughing so hard she can barely type. 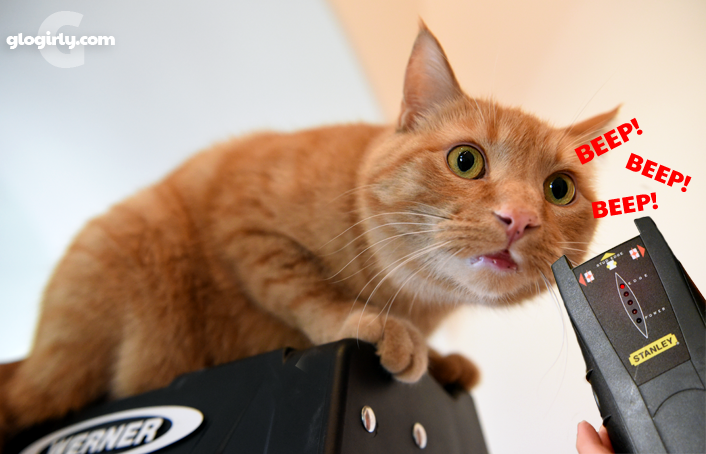 The pictures iof waffles and his very appropriate expressions on his face are just so funny! I have never seen such an expressive cat with facial expressions before! The canyon photo itself, the curve of the doorway, the colors of Waffles and the ladder - all combine to make that last picture even more beautiful ! Waffles had me in fits!!! What an absolutely beautiful photo. Don't worry, Waffles, I think you are a handsome ginger stud. What an incredible photo made even more beautiful by the story behind it. You are very lucky. Very cool. Mum looked and see that they only do daytime tours, but...what if you could get a picture by moonlight. Be there on the right day with the same angle and a full moon. 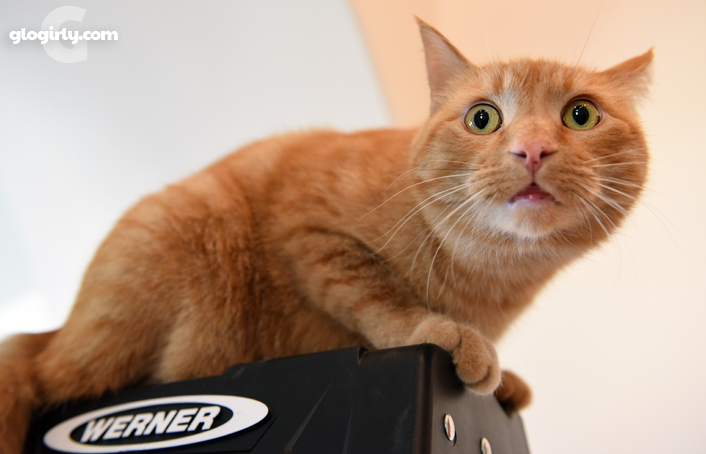 Waffles, gingerness you have, studs you do not. That is OK.
Oh my goodness, that's so beautiful (plus your home looks like a museum in that picture!). Wow! That photo is absolutely breathtaking. What a special memory. 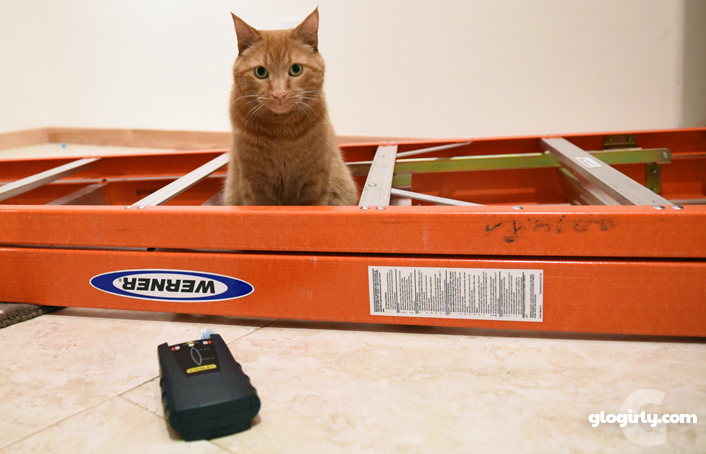 Waffles still loves his ladder! Maybe because he can show off his tail at the very top? Gloman, that is an outrageously spectacular photo. Mom says she would expect nothing less from you. (She still remembers the lessons you gave her.) 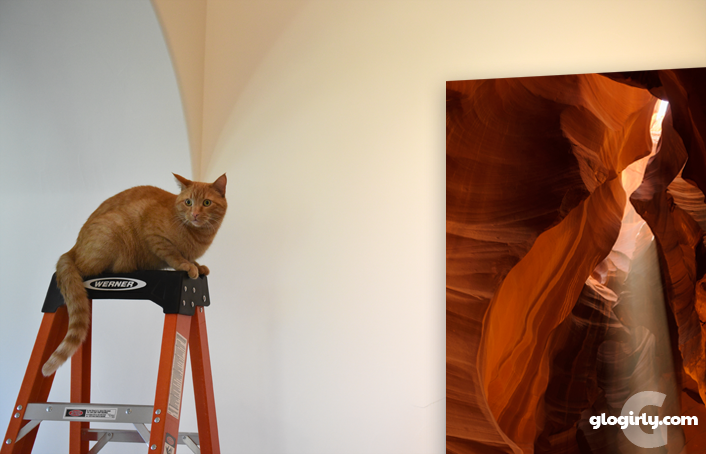 We think Waffles should be on permanent display on top of his ladder there. He looks like the perfect tour guide. Besides, he might stay out of Katie's food that way. MOL!!! Happy Anniversary to a really awesome couple of humans.